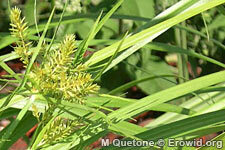 Dried calamus rhizome (root) can be used to treat stomach cramps, gas, gastric ulcers, and lack of appetite. A perennial herb that grows on the water's edge and in wetlands. It sends up leafy, grasslike stems from its underground stalk. The stems may be up to 5 feet tall. Halfway up the stem, each leaf bears a 2 to 4 inch long fleshy cylindrical flower stalk, consisting of many tiny yellow-brown flowers.